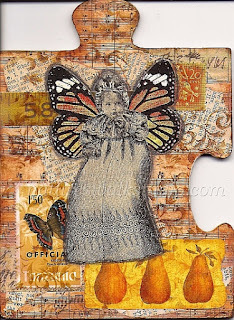 I taught a demo last week at the local art store, Stampadoodle and the Paper Cafe, and one of the things I played with was big puzzle pieces from a floor puzzle for kids. My stash was gleaned from the free pile at an estate sale. Missing puzzle pieces? Not a problem, alter 'em! 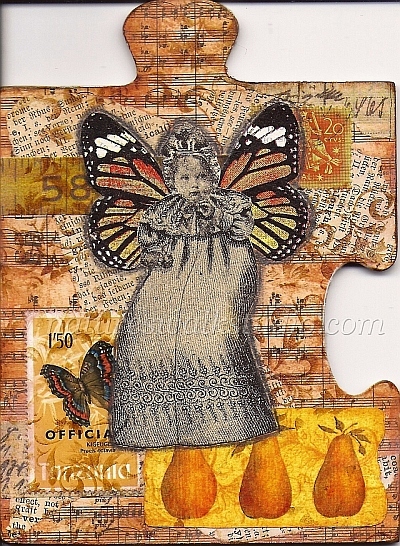 This piece measures about 5 x 4 inches, and uses vintage sheet music, text pages, postage stamps, bits and pieces from decorative papers, and the baby image is from an old catalog page.